CasamigosCasamigos was the name of Clooney and Gerber’s homes in Mexico. George Clooney hasn’t been acting much these days, and he recently said in an interview that it’s because he doesn’t need the money. He made a lot of money from his tequila company, which just sold for $US1 billion. Casamigos, Clooney’s tequila company, started as an idea between Clooney and his friend Rande Gerber while they were in Mexico. The actor founded one of the fastest-growing tequila brands in the world by accident in 2013 with two friends. Clooney’s tequila company, Casamigos, was sold this year to Diageo for up to $US1 billion. Diageo is set to pay $US700 million initially, with the potential of another $US300 million based on the tequila’s performance over 10 years, according to CNBC. Clooney came up with the tequila idea with nightclub owner Rande Gerber — who also happens to be the husband of supermodel Cindy Crawford — while the two were spending time at their houses in Mexico. The two would go on golf trips around the country with other friends — “It was called ‘the Golf trip,’ but we played maybe nine holes now and then” — which is where they met real estate guru Mike Meldman. 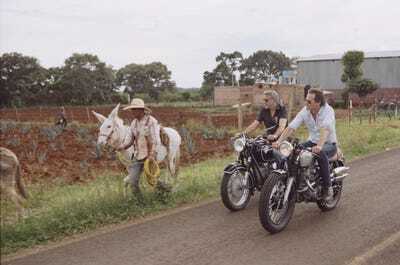 CasamigosMotorbike was the vehicle of choice for Clooney and Gerber in Mexico. While the pair may claim they can drink it all day and not be hungover the next, it’s probably not recommended for inexperienced tequila drinkers — the average bottle contains 40% alcohol. Without even realising it, Gerber said he and Clooney were bringing in about 1,000 bottles to the UK, and were told by the distiller that they needed to get licensed. CasamigosThe three founders: Mike Meldman, George Clooney, and Rande Gerber. CasamigosCasamigos is aged and barrelled in Mexico. They use a simple stick-on label on an unfussy bottle, with a plain cork to seal it. The brand sells reposado, anejo, and blanco tequilas, which range from $US32 (£26) to $US42 (£34), depending on where you buy them, according to Gerber. CasamigosGerber and Clooney still taste every batch.